We continue to appreciate our Heritage as graduates from Davis High School and the treasured friendships we formed there. We've added recent obituaries to this site and hope you'll help us know of the passing of our friends. It seems appropriate to give you information about the passing of Carolyn Adams Pierson . Carolyn left this life on Wednesday afternoon, May 2, 2018, surrounded by her wonderful family. She had felt the love of many neighbors and friends as well, as she spent the last week with hospice care following a courageous battle with breast cancer. Her joy for life was contagious, and if there was something fun going on, she was easily found in the middloe of it. Often she'd created the fun in the first place. We have been the recipients of the talents of this amazing woman for over 50 years. No one could create a display better than Carolyn could, and she loved doing it! She will be greately missed. Information about details of her viewing and funeral are in the obituary on the In Memory page on this site. Can you believe we are 70 this year? We'll let you know where and when soon. Looking for Steve Chard. Does any one know where he is and how to contact him. Well it has been a couple of weeks since we were all together at the High School. Hopefully we have all recovered from the activities. 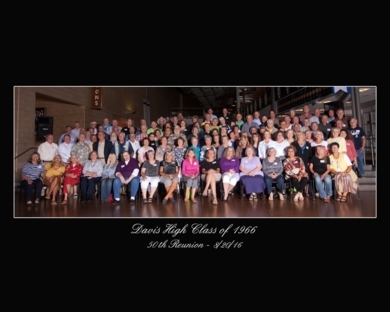 Don Thompson wanted to let everyone who ordered 50 year reunion items know that he has not yet received a shipment date; however he will get those items to you as soon as he receives them. A couple of quick notes about our Web Site. We are excited to keep the activity and communication going as we all continue on with life's journey. We appreciate all of you who have shared photos and experiences with us. We all agree that one of the many highlights of our reunion was the evening of everyone standing and sharing their lives with our classmates. We hope that you will all continue to do so. You never know when you are walking through a museum or attending a play or a live concert or hiking or walking through one of our National Parks, or even standing in line at Disneyland, who you might run into. Let's continue to share our activities. We are looking forward to the next reunion in five years; however there has been a suggestion that we schedule a picnic once a year to provide an opportunity for anybody and everbody to gather together and visit and keep the communication lines open. We could even schedule some golf, bacci, lawn bowling, or leg wrestling if need be. We are still missing some contact information for many of our classmates. We would like to continue to seek out those folks and invite them to join in the fun of this web site. If any of you have any information on any of our missing classmates please contact us. E-mail addresses would be very helpful. Until the next communication, be safe. What a truly memorable reunion we all experienced last evening. A big, big thanks to all of you who were able to attend. For those who traveled long distances, thank you. For those of you with health concerns, thank you. For those of you with family commitments, thank you. And to those of you who were unable to attend, you were sorely missed and we wish you well. We are sure that many photos by lots of classmates, and of lots of classmates will be posted and be able to be shared for years to come. Thank you Norma. What a rock star! You have been so instrumental in keeping this class together. Thank you for giving us folks on the committee the opportunity of serving our classmates, something you have been doing for 50 years! A quick note about the two Carolyn's (Dredge - Hansen & Adams - Pierson). We are all in awe about the creative ideas and high energy you two possess and exhibit. "Dredge" for all of the work setting up this web site and "Adams" for all of your memorabilia and creative enthusiasm for this reunion. Thank you. And thanks to your husbands Doug and Blaine for all of their help. You all know the work that Don Thompson put in on the golf tournament. However, you may not realize how many hours that he and Tad Goaslind, and Pat (Larsen) James, and Susan "Manning" Heath, and Kerry (Kjelstrom) Farr put in as they helped along with the planning and many other aspects of this reunion. Thanks you guys, especially Tad and Don for their abilities to fold napkins with an artistic flair! Thank you Susan (Manning) Heath for that wonderful presentation for our fallen classmates. Those few moments were very special for all of us as we together remembered our friends. And many, many thanks again to our good friends the "Barracudas" for the time and effort to provide music for us to listen and dance to. It is still amazing that a group that got together when we were just Sophomores are still together and still as entertaining as ever. That is over 52 years. They have been playing music longer than Dave Smith and Loretta have been married. Thanks again you guys. Probably the biggest thanks goes to all of you folks who took the time to stand up and tell us a little bit about yourself and what you have been up to. You all were the highlight of the evening. Thank you. Till we meet again, Darts forever. Mr Tad Goaslind had a great idea. "Why not let anyone who would like to be a part of the next reunion committe do so!" That said, if there is an interest, please contact Norma. She welcomes the help. We had a lot of fun, had some laughs, shared some tears, and created some wonderful memories. Oh, and by the way, the winners of the golf tournament was Tad's team of Rueben Cunningham, Dave Smith and Gaylen Simmons. Hey Classmates, we are getting close to just two weeks until we come together to renew, reflect, and hopefully rejuvenate our past associations. A number of you have asked about the program for Saturday evening. Carolyn (Adams) Pierson is putting the final touches on the program and we will send that out to everyone shortly. We are going to gather at the High School at 6:00 PM. The easiest place to enter will be at the northeast corner of the building. It is the cafeteria area as well as the central gathering place or "Common Area" for the building. We will have name badges for all those attending and the lettering. . . WILL BE LARGE. . . so we can easily get acquainted. Parking is available on the north side of the building as well as the east side of the building. There will be a welcome and then dinner and introductions. We would like everyone to take 10 Seconds and introduce themselves and their partner. That way we can all get better acquainted. Parking is available on the north side of the building as well as the east side of the building. At about 7:15 we will adjourn to the common area for the program. You will need to pick up your chair and carry it to the common area. The program will consist of remembering our fallen classmates, honoring our service men and women, an introduction of the championship football team followed by the cheerleaders leading us in the school song without cartwheels or splits. Donlu (DeWitt) Thayer will take a few moments and then it's on to socializing, listening & dancing to the "Barracudas". 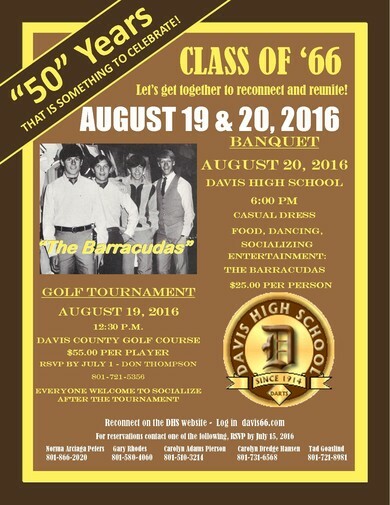 A quick side note, our personal '66 Band the Barracudas are famous! They have four original songs that can be purchased on Amazon. "It came from the Garage"- Nuggets from Southern California. There is no official ending to the program. We realize that many of us have early bed times now days; however, we can stay as long as we want, possibly midnight. The Barracudas have indicated they will play as long as people are having fun listening and dancing. Most important we want all to be safe and have fun. We have a full roster for golf on the 19th with Karl McCleary filling the last spot. That Golf Scramble Tournament is only THREE WEEKS away! The excitement is building and should be great fun. As a special side note, guess which classmate just got his first hole-in-one after 47 years of playing this crazy sport? You guessed it, Mr Don Thompson achieved the "Duffer's Delight" this past week at the Bluff Golf Course with classmates Tad Goaslind, Reuben Cunningham, Steve Drakos, Paul Smith (class of 1959), Dee Christensen (class of 1962) and Gary Rhodes in attendance. So at the tournament if you want to congratulate Don with a hug, or a kiss on the cheek, or a slap on the . . . . back. Be our guest. It might be fun to find out how many other classmates have scored a hole-in-one. Please let us know the details. We've added a survey to this announcement so you can tell us your experience. We understand that Pat (Larsen) James did it at Oakridge and Karl McCleary has had four holes-in-one. He says, "One at Wolf Mountain in Eden, One at Wasatch State Park, and one at Glen Eagle. They were all fun to get but the most memorable was the one at Eden where I was playing with my Wife and brother and they got to witness it also. Out of many hundreds of rounds of golf over the years, she finally got to witness a hole-in-one." Joe Hall says "One iin hole, Glenmoor Golf Course, Hole 13, par 3 1997. " 1) Have you scored a hole-in-one? Tell us about it. 2) Have you witnessed a hole in one? Tell us about it. Hey Classmates, please find the final golf pairings and tee times for the Golf Scramble Tournament in just THREE WEEKS !! Karl McCleary has filled the last spot so the golf roster is full. As a special side note, guess which classmate just got his first hole-in-one after 47 years of playing this crazy sport? You guessed it, Mr. Don Thompson achieved the "Duffer's Delight" this past week at the Bluff Golf Course with classmates Tad Goaslind, Reuben Cunningham, Steve Drakos, Paul Smith (class of 1959), Dee Christensen (class of 19620), and Gary Rhodes in attendance. So at the tournament if you want to congratulate Don with a hug, or a kiss on the cheek, or a slap on the . . . . back. Be our guest. It might be fun to find out how many other classmates have scored a hole-in-one. Please let us know the details. We've added a survey to this announcement so you can tell us your experience. We understand tha Pat (Larsen) James did it at Oakridge and Karl McCleary has had four holes-in-one. He says, "One at Wolf Mountain in Eden, One at Wasatch State Park, and one at Glen Eagle. They were all fun to get but the most memorable was the one at Eden where I was playing with my Wife and brother and they got to witness it also. Out of many hundreds of rounds of golf over the years, she finally got to witness a hole in one." The excitement for this event is building and it should be great fun. It looks like Saturday evening is going to be a blast!!! Hope to see you all there. 1) Have you made a hole-in-one? Tell us about it. 2) Have you seen someone make a hole-in-one? Tell us about it. 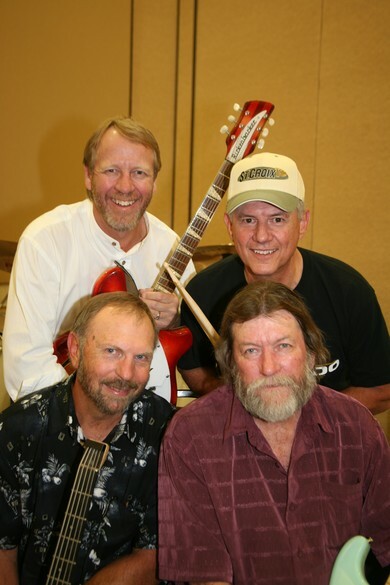 1) When did "The Barracudas" perform at our class reunion for the first time? August 1st (not set in stone) is the deadline for registering for the dinner on Saturday August 20th at 6:00 at dear old Davis High School. Please continue to encourage others to come. . . Please answer the following questions, then survey results will show up on the right hand side of the page. 1) How far do you live from Kaysville? 2) How many years have you lived out of state? 4) What teacher at Davis High affected your life the most? 5) What was your favorite extra curricular activity in High School? 6) What would you do over in High School if you had a chance? You need to know that this web site is being run by a committee for all of us. Your committee includes Norma Arciaga Peters, Gary Rhodes, Carolyn Adams Pierson, Carolyn Dredge Hansen, Kerry Kjelstrom Farr, Pat Larson James, Don Thompson and Tad Goasland. It looks like I'm running the show (Carolyn Dredge Hansen) because my name comes on emails, but that's because one of us had to get the web site going and I did, but that made me the administrator which is a joke. I'm learning, but it's a really steep learning curve and things are coming slowly. . . my grandkids are busy. Have you misplaced your yearbook? We now have our yearbooks (all three years, 64,65,66) available in PDF form. Richard Wilson (class of 1965) has provided these files for us which has saved us tons of time in developing our web site. He is making those files available if any of you are interested. The 66 book is available for $5.00 and the others for $3.00 each. He will sell all three for $9.00. You can contact him through the web site and he will send the files to you via email. in subject box put Book Order and let him know what you'd like. He will contact you with details. 1) Here's a hint. Do you recognize these musicians?